I missed the memo about being average. When I was in college, one of my classmates, who was exceptionally tall and had glorious auburn hair, referred to herself as a “statuesque red-head”. I thought that sounded so much better than “blonde girl of average height” which is exactly what I am. According to Wikipedia, the average height of American women is right about 5’4″. And I am exactly 5’4″. When I see the leggy super models in fashion magazines, I feel a pang of envy, but really being average isn’t such a bad thing. Recently, Mayim Bialik caused a bit of stir in the mommy blogosphere when she penned this piece in which she described her approach to dealing with the developmental “delays” her sons exhibited. Knowing other parents who have dealt with similar issues, the anxiety that comes with wondering whether your child is “normal” is just gut-wrenching. While it would be an over-simplification to say that Ms. Bialik wasn’t worried about how her sons were doing, it was interesting to hear about her choice to not pursue aggressive interventions to speed up her children’s developmental progress. She was OK with them not being average. Reading Ms. Bialik’s article and some of the critical responses to it made me thank my lucky stars that my son is pretty darn average in lots of ways. I’ve been spared the worry and wonder about how he’s doing because he has been hitting developmental milestones right about when he’s “supposed” to hit them. I am so grateful he is so average. 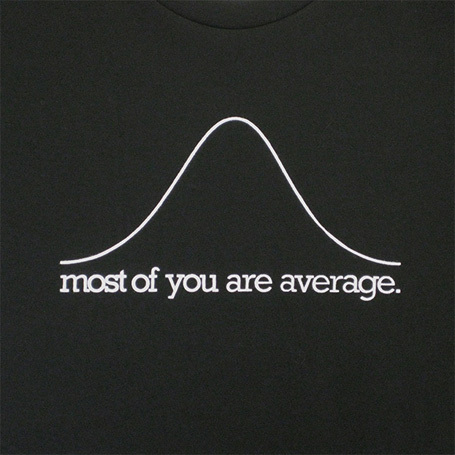 The word “average” gets kind of a bad rap. We want above average incomes and below average body fat. But sometimes being right in the middle of the bell curve is a pretty comfortable place to be. In lots of ways, the world is an easier fit for average people…for example, I’m a lot more comfortable in airplane seats than my husband, who’s an above average 6’3″. I’m no cheerleader for conformity, but I’m figuring out that by lots of measures, I’m pretty average and there’s no shame in that. Average doesn’t always mean mediocre, it just means that when it comes to that particular measure, I’m just like a lot of other people, and there’s a sense of solidarity in that. I never thought plotting my place on a bell curve would foster a sense of kinship and community, but in fact it does. Memo received. Growing up, the only other person of my generation in the family was my cousin. Unfortunately, he was profoundly disabled. I can’t think of anyone who would have been dissatisfied if one day he had woken up in the morning transformed into an “average” kid. As another 5’4″-ish blond (when I’m using that bottle and not the red one) I look at it this way: Looking average is a nice cover for how weird I really am. Camoflaging weirdness with normality is excellent life strategy! And yeah, when we encounter people who are not average in ways that makes their lives so very much harder, it makes being average feel like a real blessing. We live in a university town, and it seems everyone is convinced that their child is exceptional. Everyone wants their child labeled “gifted” and will even go so far as to pay for prep courses for kids taking screening exams. In first grade. No matter what we may wish to believe, most of us are average looking and only slightly sharper than the average bear. You know what gifted is? Mozart writing operas at 7. Kids who graduate college at 12. Math prodigies. LeBron James. Some of us are gifted. Most of us are normal and so are our kids. Nothing is wrong with that. I am pleased that I am far above average in attractiveness however. Amen, Jeff. I once had a boss whose motto on punctuality was “early is on time and on time is late.” I think a similar way of thinking is creeping into what people are expecting from their children, like kids have to be exceptional in order to be normal–not fair to the kids and crazy-making for the parents. And yes, I am also pleased that you are far above average in attractiveness.